Lanesboro native Pádraig Donlon was presented with a Special Recognition Award at the 64th Longford Association in Dublin, annual dinner dance and gala awards in Moran's Red Cow Hotel on Saturday. Pádraig is married to Valerie Leech, a champion dancer from Dundalk. They have a family of four, two boys and two girls. Cillian (Concertina), Iarla and Siobhán (Fiddle) and Fionnuala (Harp) all play with the Dundalk branch of Comhaltas. And during Saturday's function, Pádraig was joined on stage by Cillian and Fionnuala, and colleagues from Dundalk Comhaltas, where they performed a number of tunes. An accomplished Uilleann Pipes player, Pádraig is a multiple Fleadh Cheoil na hÉireann winner, and he has performed on numerous television and radio programmes. Leader of the Táin Céilí Band, they won the coveted All-Ireland Fleadh Senior Band title three years in succession from 1998 - 2000. They played to their biggest live audience on a December night in 2000 when they entertained President Bill Clinton and an audience of over sixty thousand in Dundalk town centre. Since the late eighties Pádraig has devoted much of his time to the work of Comhaltas Ceoltóirí Eireann as an administrator, a teacher and an adjudicator. He now dedicates more time to organising and adjudicating at Fleadhanna Cheoil than he does playing at them. Last year he was very much involved in the running of the very successful Leinster Fleadh in Ballymahon and he is currently a member of the Fleadh executive committee planning for Fleadh Cheoil na hÉireann 2018 in Drogheda. It was in recognition of his life long contribution to Comhaltas Ceoltóirí Éireann and traditional music that Padraig was presented with the prestigous award of Árd Ollamh during Fleadh Cheoil na hÉireann 2017 in Ennis. 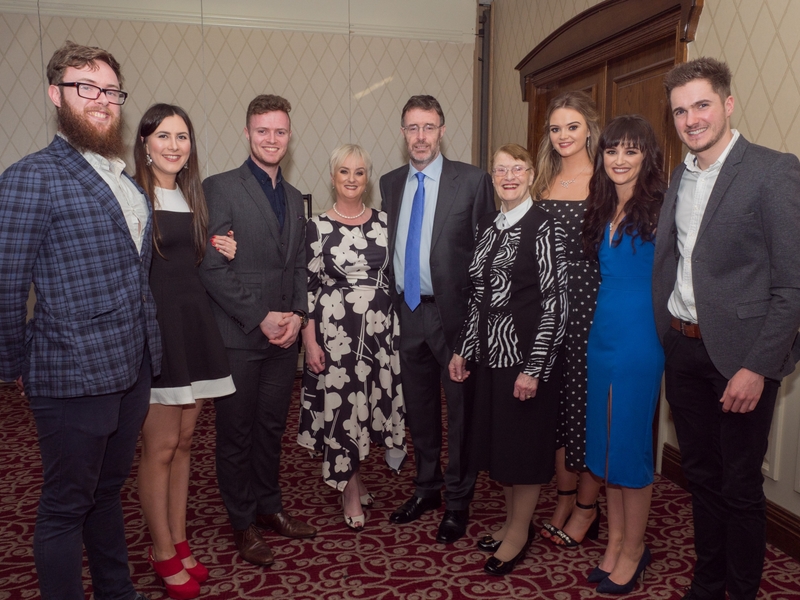 Caption: Donlon family members, Cillian, Eleanore Deery, Iarla, Valerie, Padraig, Vera, Fionnuala, Siobhan, and David McFall.